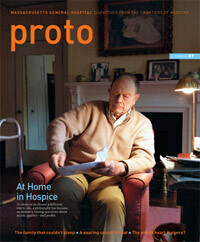 Charles Bennett and Franklin Wyman, both of whom were featured in my story‚ “At Home in Hospice‚” (Spring 2007), died shortly after the issue was completed. It was courageous and generous of them to share their stories during their final months, and for me, it was a privilege to interview them. Each told me that he hoped to make people more aware of what hospice is and to inspire others to make that end-of-life choice if they find it suitable. Annabel Clark, who spent the day photographing Wyman, says that despite his failing health, “he was game for all the different shots that are part of the process.” Wyman read the published article; I was told that he was pleased and that he considered it one of his final contributions to public service. He died a few days later, comfortably and surrounded by loved ones at his home. We thank Franklin Wyman and Charles Bennett and their families for their participation and extend our condolences. Linda Keslar // Braselton, Ga.
D.T. Max’s “In Pursuit of Prions” (Spring 2007) is a cogent exposition of the history, research and current state of knowledge of these heretofore baffling infectious/mutational/genetic conditions. Thanks for an interesting presentation. Michael Skolochenko // Valdese General Hospital, Valdese, N.C.
To the discussion opened by Rachael Moeller Gorman in “The Body in Pain‚” (Spring 2007), it’s important to add that along with an improving understanding of the biological and physiological aspects of pain sensitivity, our appreciation of the psychosocial aspects of pain is also rapidly growing, with great benefit to patients. Studies of chronic pain are surprisingly consistent in finding that effective coping skills, a positive attitude toward illness, and reduced psychological distress (for example, less anxiety and depression) are the keys to increased function and improved quality of life. Because patients with chronic illness and pain often pin all their hope onto a pill or an operation, it is important to emphasize myriad sources of hope. Don’t forget the mind. Vicki Jackson, director of the Palliative Care Unit at Massachusetts General Hospital, interviews doctors Danielle Ofri and Charles Bardes on their thoughts on death.